Are Gold Bulls Naively Optimistic? Are gold bulls naively optimistic? They are certainly optimistic; at least as regards their expectation for higher gold prices. But is that all that is needed to make them happy? If gold marches higher from here, does that signify that all is well? Would the gurus and wanna-be millionaires be proven correct if gold were priced at $10,000.00 per ounce? We could ask when. But if those who expect big things for gold are correct, then when might not matter. Let’s say you want to buy a stock – any stock – that is priced at 13. You have done your due diligence and you are convinced that it can go to 100. Back up the truck, right? But most stock investors and traders are not looking for such huge, unrealistic gains. At the outside, they might see the possibility of the stock doubling in price; eventually. So, if gold’s price doubles from its current level, will that be enough? For most of them, probably so. At least, thinking about it in advance stokes the euphoria and seems to provide justification for their optimism. But, if gold doubles from $1300.00 to $2600.00 in the next couple of years, is that enough to prove the case for the bulls? To a limited extent, possibly. But not likely. Here’s why. Gold’s price in today’s dollars needs to reach $2000.00 per ounce just to match its inflation-adjusted high in 2011. What if you already bought that stock (gold) at 18 and now it has dropped to 13 over the past seven and one-half years. You are holding on because you believe the fundamentals are such that you will see that stock go much higher again; and soon. But how long can you hold on? After the gold price peaked in 1980 at $850.00 per ounce, it began a long decline in price which lasted twenty years. The eventual bottom, at approximately $260.00 per ounce, represented a drop of seventy percent. Gold did not reach and surpass its former high until eight years later, in January 2008. It has only been seven and one-half years since gold’s peak price of close to $1900.00 per ounce in August 2011. Can you wait for twenty more years to see gold at $2000.00 per ounce? Likely not. Even five more years would be incredibly painful to those who are ready to cash in their winning ticket now. You would also need to endure a drop in gold’s price to about $600.00 per ounce before it reaches the bottom and resumes its long-term advance. Most investors today couldn’t tolerate gold revisiting its previous low of $1060.00 from just three years ago; let alone sitting patiently through a decline of more serious magnitude. But there is additional cause for concern, even if you are correct in your forecast and patiently resilient. And even if a worst case scenario similar to the above doesn’t happen. Regardless of the time duration, you will most likely be disappointed with the results. By the time gold reaches $2000.00, you will need to see a higher price to break even. In real terms, you will never exceed that point. All other things being equal, if the price of gold were to go straight to $2000.00 per ounce from here in a short period of time, you would have nominal profits of about $700.00 per ounce based on gold’s current price of $1300.00 per ounce. But accepting that logic at face value and acting on it won’t give you what you expect in real profits. As you can see in the chart, there are only two times (1971-1980 and 2000-2011) in the past fifty years when gold presented the opportunity to truly carve out some real profits. Of course, you would have to have been prescient enough to have acquired gold early enough in those two time periods and sold soon enough. Unfortunately, most people didn’t do that. And most of those who actually own physical gold are not traders. That means they understand and appreciate gold for what it is – real money, original money. In most cases, they have owned gold for years, maybe decades. Even so, they are not profiting from their holdings. Most people associate higher prices for something as an indication that its value has increased. A higher price means it must be more valuable. That can be true for corporations, small businesses, and commercial real estate. But it is not true for gold. Gold’s value is constant and unchanging. It is real money. And it is real money because it meets the criteria of real money: 1) medium of exchange 2) measure of value 3) store of value. Gold is also original money. The U.S. dollar and all paper currencies are substitutes for original money, i.e., gold. And all paper currencies are inflated and destroyed by their issuing governments and central banks. Gold is not subject to the traditional law of supply and demand. Nearly all the gold that has ever been mined in history is above ground. The annual production of gold from mining and extraction accounts for only one percent (sometimes a bit more) of that total supply. As such, gold’s limited, fixed supply acts as a restraint on governments who like to create money out of nothing. Which is exactly why governments don’t like gold. They will tell you that they prefer paper because it is more convenient. And they might also argue that paper and credit are more ‘flexible’. Nevertheless, anything other than gold is not real money; and the risks of using anything other than gold are exponential. All paper currencies are guaranteed to fail. Gold’s value is in its use as money. As such, its value is stable and unchanging. Gold’s value today is the same as it was fifty or one hundred years ago; centuries ago. And its value will not be greater in the future. Regardless of its price in dollars or any other currency. The U.S. dollar has lost more than ninety-eight percent of its purchasing power over the past century. That means it costs more than fifty to sixty times as much today to buy the same or similar goods and services as one hundred years ago. Looking back at the late 1960’s, a similar house would probably cost about forty thousand dollars. The doubling of its price over the previous forty-five years is the equivalent of a fifty percent loss of purchasing power for the U.S. dollar, and correlates with a doubling of gold’s price to $41.00 in 1968. There are six major turning points (1920, 1933, 1971, 1980, 2001, 2011) on the chart above. All of them coincided with – and reflect – inversely correlated turning points in the value of the U.S. dollar. And, as we can see very clearly, gold failed to make a new, inflation-adjusted high in 2011. This is perfectly reasonable, because gold’s upward price movement reflected the extent of ongoing U.S. dollar devaluation that had occurred since the eighties. 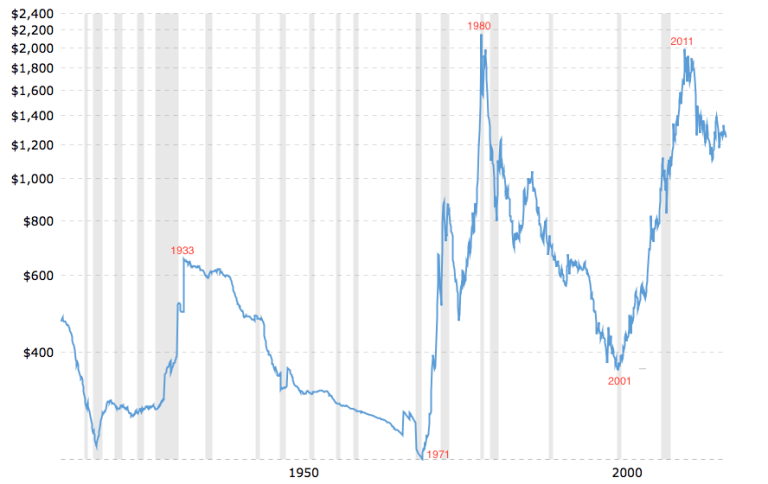 Whereas, the price movement upward in the seventies reflected U.S dollar devaluation that had occurred over the prior forty years – a period more than twice as long. Gold’s changing price is not an indication of its changing value. The value of gold is constant and does not change. Its higher price over time is a reflection of the continuing loss in purchasing power of the U.S. dollar. If gold’s price were to double from here and rise to $2600.00 per ounce, it would be because the U.S. dollar had renewed its long-term decline in earnest. Otherwise, it is not going to happen. None of the other so-called fundamentals that are cited, analyzed, discussed, explained, (and exclaimed) have any bearing or impact on the price of gold. None of them. This means that any sudden spike in the price of gold that is not accompanied by a corresponding decline in the value of the U.S. dollar will not endure. Problem is, most of those who think they understand this still think that when gold eventually goes to $3000.00, $5,000.00, $10,000.00, they will be millionaires. Well, yes; but it won’t matter. If the U.S. dollar collapses, and gold’s price shoots upward to $6500.00 per ounce, it would be reflective of an eighty percent loss in the dollar’s purchasing power. This means it would cost you five times as much to buy the necessary goods and services to maintain your lifestyle. You would need your gold ‘profits’ just to pay for the increasing prices of everything else. You won’t get rich. And if the dollar suffers complete repudiation, then the price loses all meaning. Would you sell your gold for one billion dollars of Monopoly money? © 2019 Copyright Kelsey Williams - All Rights Reserved Disclaimer: The above is a matter of opinion provided for general information purposes only and is not intended as investment advice. Information and analysis above are derived from sources and utilising methods believed to be reliable, but we cannot accept responsibility for any losses you may incur as a result of this analysis. Individuals should consult with their personal financial advisors.